A group of 45 national security experts signed a letter released Tuesday that calls on President Donald Trump to withdraw from the Iran nuclear deal. The letter, released by the Center for Security Policy, calls on Trump to withdraw the U.S. from the Joint Comprehensive Plan of Action, or JCPOA, using a plan proposed by former Ambassador to the United Nations John Bolton. It also asks Trump not to certify that Iran has been in compliance with the agreement. Trump has in recent weeks renewed his criticism of the deal, which he attacked vehemently on the campaign trail. 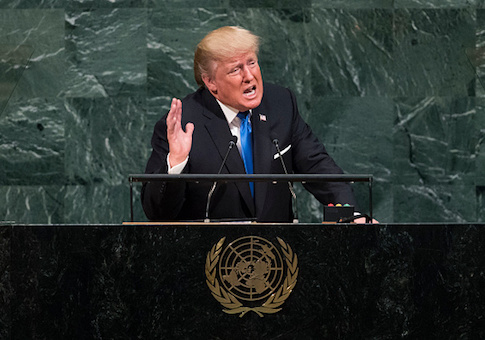 Amid speculation that he might refuse to certify compliance at the upcoming Oct. 15 deadline, Trump slammed the JCPOA in front of the United Nations on Tuesday. "The Iran deal was one of the worst and most one-sided transactions the United States has ever entered into," Trump said in his speech. "Frankly, that deal is an embarrassment to the United States and I don't think you've heard the last of it, believe me." The letter's signatories criticized the JCPOA as allowing Iran to continue to pursue the development of nuclear weapons, having weak verification provisions to ensure Iran's compliance, and ignoring Iran's "increasingly destabilizing behavior." "After the JCPOA, Iran's behavior has significantly worsened," the letter reads. "Tehran stepped up its ballistic missile program and missile launches. There was a 90% increase in Iran's 2016-2017 military budget. Iran has increased its support to terrorist groups and sent troops into Syria. Harassment of shipping in the Persian Gulf and Red Sea also increased, including missiles fired at U.S. and Gulf state ships by the Houthi rebels, an Iranian proxy in Yemen." The letter also highlights the possibility that Iran is sharing nuclear technology with North Korea, which has undertaken a series of escalating nuclear and missile tests in the past several months, provoking sanctions from the United Nations. It further expresses suspicion at the prospect of Iran ever allowing renegotiation of the terms of the deal, despite some analysts' claims to the contrary. "The day will never come when the mullahs agree to amend the sweetheart deal they got in the JCPOA," the signatories write. The Bolton plan, which the letter's signatories endorse, alleges that Iran has violated the terms of the JCPOA, and advocates for a withdrawal focused on incorporating key allies—including Saudi Arabia and Israel—and waging a diplomatic campaign to "ensure continued emphasis on the Iran threat as a top diplomatic and strategic priority." Among the letter's signers are a number of national security notables, including several former under secretaries of defense, a former director of White House science and technology policy, one general, and one admiral. This entry was posted in National Security and tagged Donald Trump, Iran Nuclear Deal, John Bolton. Bookmark the permalink.